After spending tons of time researching HK hotels, I just couldn't make myself plan for Thailand so I came up with a general plan (bought plane tickets to Phuket and booked one adventure trip) and decided to wing it. This worked out pretty well, since weather and transportation can be unpredictable. Just gotta take things as they happen. We left HK on Tuesday morning and landed in Phuket around noon, with a torrential downpour to greet us. Not a great way to start things off, but what could we do? After making our way through customs, we had to figure out a way to get out to Phi Phi island, since our plans that night were to camp at Maya Bay. Or not, since it was pouring. Lucky us there was a tourist desk selling ferry tickets to Phi Phi, right there. Maybe we paid a little bit extra, but it was cheap enough and easy. They got us a taxi driver to take us out to ferry at Ratsada, which is about 45 minutes from the airport. It poured the whole way, yet people were still out riding their motorbikes, covered in trash bags or rain slickers. We found the right check-in desk for the boat, traded our paid vouchers for tickets, and got on board with our bags that had now been drenched in the rain. Thankfully I was able to leave a couple suitcases in my hotel in HK, so I just had a duffel bag. I knew from our Catalina trip that I would probably get a little sea sick, so I popped two Dramamine before we got on the boat. My choice was confirmed to be a good one when a crew member walked around making a wave motion with his hand and said, seasick? and gave out Dramamine to all passengers. I had no idea what we were in for. Two hours of eyes closed, praying, being tossed around, having a water drip over my bag, Josh yelling "whoa, look at the wave!" and hearing huge waves crash against the side of the boat and puking by fellow passengers, we arrived in Phi Phi. I really thought I was going to die. I'd heard that Thai ferries can have questionable safety practices, and after reading reports of major flooding and ferry rescues by the Thai Navy the very next day, I am amazed that I landed safely. We probably should not have taken off in that heavy rain. Alas, I am alive and well. We got off the boat, still raining, and headed to the meeting point of the camping trip to find out how to get a refund or reschedule. We got a little lost and wandered around for a good 15 minutes in the rain, and then began to wonder where we'd sleep that night since our camping adventure was off. 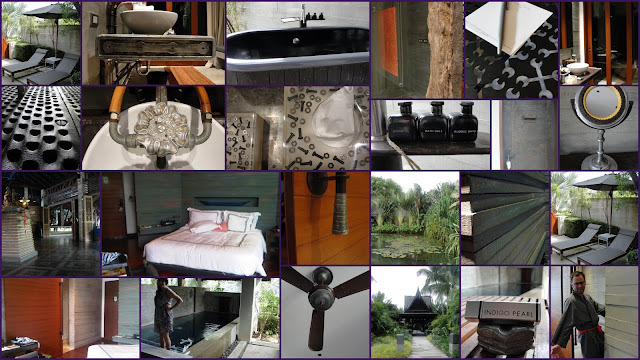 More wandering around in the rain and only finding places with no vacancy, we stumbled upon JJ Residence which is a hidden gem. Too expensive for backpackers, but just perfect for us. All we really wanted was a dry place, and we scored. At this point the Dramamine was at full effect - I couldn't keep my eyes open. MCB was ready to roam around, and in my stupor I told him to come back and get me for dinner and not to let me sleep too long, and to take the room key. He says he told me he wouldn't go far, more than two turns away, and clearly I didn't hear this. Two hours later I woke up, in the dark since you need the room key to get any electricity, hung over from the drowsiness, wondering where MCB was, and hungry. Bad mood creeping in, and fast. I probably sat there for 45 minutes, debating on how I'd find him, wondering when he'd be back and if I should stay put or venture out. It was our one and only "fight." Took me a little bit to stop being mad, but he'd found a good cheap place for food around there corner, where he'd literally been sitting for hours, waiting for me to show up. If I'd just walked outside, turned left (there was nothing to the right of us) and walked 20 feet, I would've found him. I maintain he could've just as easily come back for me. After a fairly easy climb, we reached the top. Phi Phi is essentially two mountains connected by the low-lying isthmus where the village is located, and that's a big part of what got wiped out during the 2004 tsunami. The waves came from both bays on either side. 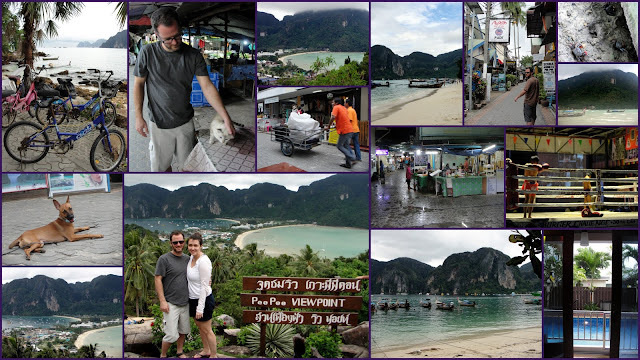 There's not a whole lot to do on Phi Phi island - a couple days and you've mostly seen it all. We spent the rest of Wednesday trying to teach me chess (fail) and playing a lot of cribbage, which is the best game ever. There are lots of rules and it's hard to remember them all, but MCB is great at teaching. Wednesday evening we sat at a coffee shop, watching the world go by with our cards. Then it was time to explore the Phi Phi nightlife, which is lots of foreign backpackers carrying colorful beach buckets around, instead of making sand castles, they have strong beverages in them. I suppose I am getting old since this fun atmosphere holds no interest for me. However, we did have to check out the Thai fighting in one bar's boxing ring! They'd take a volunteer from the audience and parade him/her around the crowd, trying to find an opponent - crazy! MCB said he's glad I didn't tell him to do it, because he'd be torn in wanting to prove his manliness for me and his fear of getting the crap beat out of him. Thankfully I'd never want to see him do it. But some girl was up for it! She looked kinda tough at first but she clearly lost. They hugged at the end and cried. Like girls. Entertaining to watch, at least. A couple doors down we found a Thai metal cover band, so we rocked out for a few songs. And that was our night on Phi Phi island. Thursday morning we woke up, ready to get make it our last day on Phi Phi. We spent the morning exploring other parts of the island. There are some resorts away from the village along with some better beaches. After some souvenir shopping, it was time to escape. I'd hoped to catch a ferry to Railay Beach, where they had excellent rock climbing. MCB is a climber, so I'd promised him this at the very least. We checked out of our hotel and went to check out ferry tickets, there was supposedly one around 2pm. Except after hauling our stuff to the dock, there wasn't a ferry. Why - I don't know. We'd purchased a round trip ticket with an open return back to Phuket, or to a third location. When I showed the boy outside the ticket booth (the official looking worker lady pointed to him like he was actually the one in charge) our voucher, he said there was no ferry. Agh! Of course not. Stuck in Phi Phi for another day. Except that the sun was shining, so maybe our original camping trip would actually be running. We walked back to the Lemongrass restaurant, I saw the Aussie guy who must be in charge, and sure enough, they were going to take off within the hour. He'd actually already refunded my earlier payment, so we had to run to the ATM to get more money, but we were on board! I changed into my swimsuit in a sketchy bathroom, packed MCB's backpack with overnight essentials, and we stashed our stuff in their storage area. The tour sometimes has up to 40 people - we had six. Me and MCB, a German brother and sister who'd been traveling for three weeks and a couple from the UK who were living in Phi Phi and had made friends with the crew, so they'd just tag along from time to time. 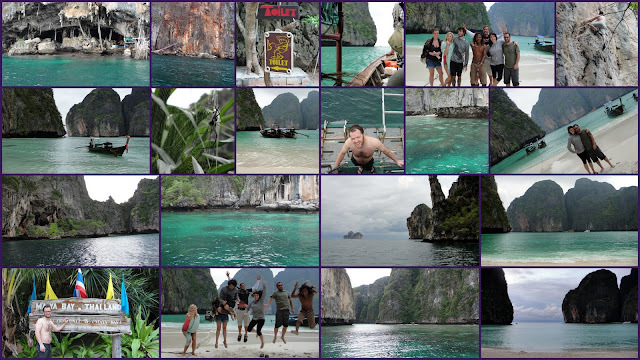 We hopped on a boat, took off toward the little island (Phi Phi Ley) and first stopped at the Viking Caves. People live in these caves, harvesting birds' nests for use in soup - a delicacy in China. No one is allowed in, other than residents and researchers, so we just watched from the boat. It's crazy to think that people live back in there! As the sun came out, I finally got a glimpse of the beautiful turquoise waters that I'd been dreaming about. This was truly beautiful. We rounded another little curve and stopped the boat for some snorkeling. I was worried about cold water as I always am, but it wasn't too bad. MCB popped on his mask and looked like he was ready to go - little did I know that this was his first snorkeling experience! I always get excited about going, but when it comes to jumping in and seeing all the weird stuff under the water, yeah, I don't always love it. It does kinda freak me out. MCB admitted later that he was being brave too. After about 20 minutes we had our fill, but we saw some good stuff! The corals had lots and lots of fish. After another stop in a bay, we were told we had to jump out and swim across to shore, then walk through a tiny cave to get to the other side of the island and Maya Bay. The big boat drove around with our stuff and brought in a long tail boat to shore with all our provisions for the night. We and the Germans explored the island while everyone else set up. Since we didn't make it to the cliffs of Railay, MCB climbed here. As the sun set, it was time for dinner - delicious curry and rice with steamed veggies. We pulled some straw mats out to the beach, turned on the speakers and iPod (yes, we had a generator and long electrical cords) and started the party. And maybe the guides partied a little too much since we were such a small, young group. Ah, well. M and Nemo were good company. Once the pitch black hits, there's not a lot to do. I was too scared to venture too far from our campsite, even though we were the only people left on the island. All the other tours have to leave at sunset. There was a long, roofed hut with a raised plank to sleep on in case of rain, but I decided to sleep on the beach. I took my mat, sleeping bag and pillow a ways down from the campfire and attempted to drift off. Not the most comfortable, and I woke up feeling not so rested, but hey, I've slept on the beach in Thailand, so add that to life experience. The next morning the crew made us a good breakfast, but my stomach wasn't feeling so great. We boarded the long tail boat out to the big boat and took off for home. MCB left his wallet and climbing shoes in the long tail, and thankfully we were able to flag that guy down and have him come back out into the bay. We had another snorkel stop on the itinerary, but no one was up for it. However, if you do ever make it to Phi Phi island, I'd recommend doing this trip. Our pre-paid ferry back to Phuket wasn't until 2pm, but we bought tickets from another company that had a boat at 1pm. That still gave us 3 hours to kill though, and we were tired and dirty with no place to go. We walked back to our original hotel to see if they'd give us a room for 3 hours, but instead they gave us a key to a public sort of shower/toilet structure across the street. The water was freezing, but I did feel better after being clean. My stomach was still upset and I was exhausted, so we just sat on a porch and waited. Back on a ferry, and thank goodness no more rains and winds. I had taken my last half dose of Dramamine and was able to tolerate things just fine. MCB on the other hand - not so much. He had to go outside, lay down and get some fresh air. Not feeling well at all. There aren't any taxis that hang out at the arrival pier, so a guy from our boat company put together a shuttle of people going to the same area of Phuket (it's a big island). We were headed to the airport area for our last night in Thailand, to stay at a resort that was recommended by a coworker in Singapore. This place was THE BEST PLACE I'VE EVER STAYED. I think all the other backpackers from our van who were getting dropped off at the airport were jealous. We stepped into the gorgeous open air lobby. We looked for the check-in desk. Instead, they motion for you to sit in their plush chairs, someone brings you a fruity drink, and then someone else brings you all the paperwork you need to check in. Then, they drive you to your room in a golf cart, because the grounds are enormous. Since I hadn't planned Thailand at all, while I was in HK, MCB and I were sort of planning via Google chat. I told him about my coworker's recommendation, and he took it and ran with it, booking us into basically the nicest room they have. This place has lots of types of rooms, and you could go cheap if you wanted. But we splurged! Wonderful design. Outdoor bath (you can call someone to fill it up with salts, etc, and they massage you while you wait for it to fill), private pool, private courtyard, rain shower, just incredible. The place used to sit on a tin mine, and that theme is incorporated into all of the design. I really wanted to stay in the Indigo Pearl for the rest of my life. The next morning we both felt quite a bit better and set off to enjoy the amazing breakfast buffet that was included. Anything you want - it's there for you. Incredible spread of both American and Asian breakfasts. We explored the grounds a bit and walked outside into the little village to cut out to the beach. The beach isn't all that spectacular, so if there's ever a next time, I'll stayed holed up in the resort, trying out all the restaurants and spa treatments. Soon enough we were in a cab, spending the last of our baht in an airport massage lounge. I got a shoulder and neck one - it was awesome! MCB had has first foot massage, and I felt bad for the lady cause she had to touch all his bug bites that he got while sleeping on the beach. DragonAir took us back to HK. We checked into a mediocre hotel on HK Island this time, since we'd mostly been on Kowloon. Great Wan Chai neighborhood, though quite old, small rooms. Had to venture back to original hotel to get my bags that had been left there, and haul them back. We did venture over to the Symphony of Lights, the coordinated laser show of all the buildings. Worth seeing once, it's a tourist thing. Then dinner at Pizza Hut. Again. Sad. But good! Our flight on Sunday wasn't until nearly midnight, so we slept in and lounged around the room as long as possible until we thought they'd kick us out. Then our last adventure, to Stanley Market! We caught a double decker bus to the south side of HK island (along with a ton of other tourists). It's a great place to shop, though I wasn't really in the mood for buying a ton of souvenirs or gifts. Been there, done that, I guess. I did buy a nice black and white print of HK in the 60's and I had to pull MCB's wallet out of his pocket to make him buy a scarf that was less than $3. I shall tame his miserly ways some day! We landed at LAX before we took off, making our Sunday 37 hours long or something, and Monday I came back to real life. As much as I enjoyed the trip (though I won't be back in Phi Phi again), I think I'm done with Asia for a bit. Time to head south and speak some Spanish! i love it all! i felt like i was reading an adventurous book. maybe you could make a children's book out of it, but then again it might be weird to have a page in a kids' book about feet massages and bug bites. Then again, you never know what kids are into these days.